Spring powder skiing at Beaver Creek (photo from Beaver Creek Facebook page). 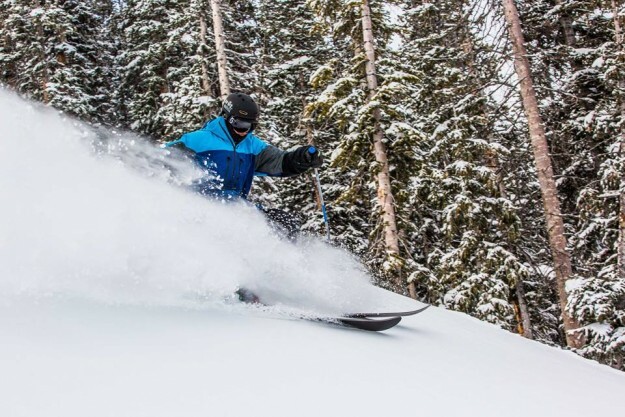 Update on Wednesday morning: Beaver Creek was again the big winner with 8 inches new overnight for a two-day total of 18. Vail saw 4 new for a two-day total of 13 new. And it was snowing hard still in Avon as of 7 a.m.
Beaver Creek was thick and creamy Tuesday morning, with 10 inches of new powder filling the troughs between the moguls on Grouse Mountain and the glades between the trees in Royal Elk Glade. It was cold and wonderful and so worth the wait after nearly a month and a half of balmy temperatures and very little new snow. I now have skied 26 days this season, and more than 20 of them have been powder days. But the vast majority came in December and January. Since the first couple of days in February, there’s been nothing that really resembled a true powder day … until today. And while it was a bit firm underneath that 10 inches of fresh (understandable given how warm it’s been lately), the good news is the temps stayed relatively cold during the day Tuesday and another 5 to 10 inches of new snow is expected to fall Tuesday night into Wednesday morning. That new snow on top of the last blast will give both Vail and Beaver Creek mountains more of a bottomless feeling on Wednesday morning. All of that bodes well for the remaining three-plus weeks of the ski season. The base held up remarkably well during our dry, warm spell — which I understand a lot of skiers actually like — and now we’re getting a late-winter pasting to carry us through closing day at both resorts on Sunday, April 10. The World Pond Skimming Championships make a triumphant return to Vail Mountain’s Golden Peak base area for the 14th year on Sunday, April 10, 2016. Skimmers from far and wide will gather in Vail to test their buoyancy on Lake Golden Peak for the chance at the title of 2016 World Pond Skimming Champion. One male and one female winner will each win a 2016-2017 Epic Pass and a pair of Liberty Skis. DJ Bulby, who has worked with artists such as Rihanna, Jimmy Cliff, Britney Spears and Michael Franti, will be at Golden Peak spinning tunes starting at 4:30 p.m. The closing day tradition of donning costumes and skimming across icy water at the legendary World Pond Skimming Championships holds strong as participants will soar off a snow jump in the hopes of coming out on the other side. The spectacle defies the laws of physics and common sense as a panel of highly-skilled judges scores each competitor on distance, style, creativity and water resistance. The contest begins at 3:00 p.m. and the Golden Peak venue opens at 1:00 p.m. for sponsor expos and giveaways. Registration for this year’s World Pond Skimming Championships is now open at springbacktovail.ticketleap.com/pondskimming/ and costs $75 per competitor. The field is limited to 75 participants ages 14 and older on a first-come, first-served basis. Entries for this outrageous event sell out quickly each year, so those interested in participating are encouraged to register immediately. Registration to participate must be completed online prior to the event; no on-site registration will be available. The World Pond Skimming Championships is a long-standing closing day tradition on Vail Mountain and is a well-loved part of the lineup of entertainment at Spring Back to Vail, the yearly festival to celebrate the conclusion of the skiing and snowboarding season in Vail. The schedule of entertainment also includes a free concert from Chris Robinson Brotherhood with opening act Eminence Ensemble at Solaris in Vail Village on Friday April 8 to kick off closing weekend. Extend your stay and save up to 50% on spring break lodging! Visit www.vail.com and check out the ‘Sunshine and Savings’ deal. Be sure to check out the Vail Film Festival Virtual Reality 20′ x 20′ tent (at Checkpoint Charlie) that will feature FREE virtual reality programming such as Cirque Du Soleil, Safari, News Stories, etc. for both festival pass holders and the general public. Various Vail and Lionshead businesses will be offering “Triple R Rewards” throughout the Spring Back to Vail weekend. Think great deals promoting the three R’s: Restaurant, Retail and Relaxation. Spring Back to Vail is presented by Vail Mountain, Pepsi, Bud Light, Town of Vail, Audi and Smith, and brought to you in part by Helly Hansen, Nature Valley, Vibram, GoPro, Liberty Skis, Vail Resorts Retail and Colorado Mountain Express.